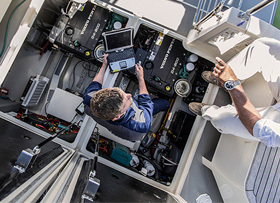 As part of Volvo Penta’s customer support team, Pamarine provides after sales warranty services, parts claims and service support for Volvo Penta users in the marine commercial engines, marine leisure engines and industrial engines. Founded in 1975, Pamarine is a privately held market leader focused on the supply and servicing of marine equipment. As a highly qualified and dedicated partner to our clients, consulting on equipment needs and regulatory controls, Pamarine delivers turnkey solutions supported by uncompromising high standards of service that are certified to the latest requirements of IMO, SOLAS, the EU and USCG. Copyright © 2015 Pamarine Private Limited. All rights reserved.